In these days of small, slick hi-fi products in fashionable black, it’s hard to remember the days when teak was “in”. To those of us who survived the late 60s and early 70s with a mono Dansette record player or an old radiogram which was basically a sideboard that someone bunged a radio and turntable into, the music centre was sheer luxury, if not due to the fact you could move the speakers to acheive the stereo effect instead of having to sit within two feet of the radiogram. Perhaps its most important feature was the built in cassette deck, allowing the owner to record directly from the radio or turntable, eliminating the old microphone-to-speaker recording technique which would always faithfully reproduce the background noise, traffic, family members singing along etc, before the main source. DON’T: – Play records with the clear plastic cover down. Despite it actually preventing dust falling on the vinyl, it just doesn’t look cool. DON’T:- Use the autochanger spindle. Use the short one that requires you to get out of your chair every few minutes to change the side. This shouldn’t matter – what are you doing playing singles on it anyway ? Next thing you’ll be playing 78s. Tsk ! DO:- Speak authoritively about your diamond stylus and hope that a real hi-fi buff doesn’t visit and ask you if it’s got a belt drive or if you’ve got woofers and tweeters in your speakers. The music centre can still be found in some second hand stores and car boot sales. 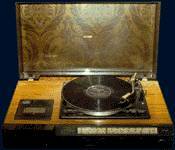 Maybe they will experience a revival – just try to find a system with a turntable in the current shops ! This entry was posted on Thursday, April 25th, 2013 at 9:48 pm	and is filed under Fads and Fashions Of The 70s and 80s. You can follow any responses to this entry through the RSS 2.0 feed.